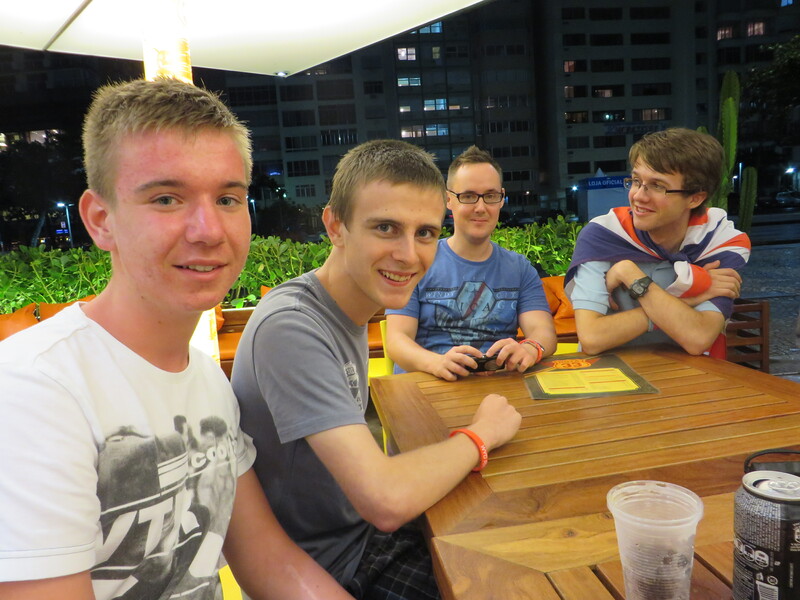 Following World Youth Day in Rio 2013 some of the young people with the MSC Vocations team reflect on the week’s highlights. One of my favourite experiences of the World Youth Day (WYD) so far had to be the visit to the Sugar Loaf Mountain. Despite the wind and cold, spirits were high as pilgrims from the world over united in song and chants, sharing photos and gifts. This was our first real experience of the WYD atmosphere and I’m pleased to say that it only grew bigger throughout the week as we made new friends. The Opening Ceremony was another highlight for me, since although we were divided for our group it was easy to meet other groups and everyone was happy to mix and invite us in. 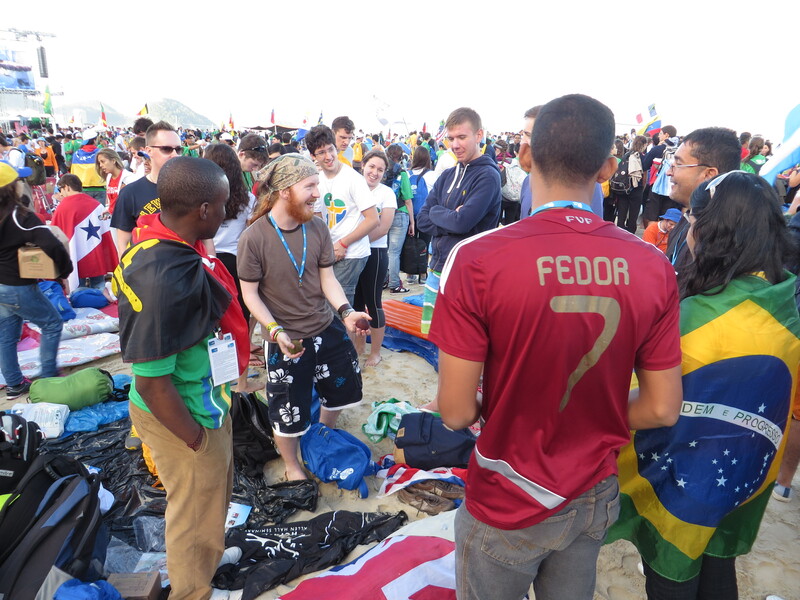 For me, it is this feeling of togetherness, unity and celebration that has made WYD such a fantastic experience. 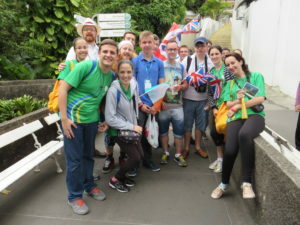 I came to Rio in order to strengthen my faith and hopefully find the reassurance that thousands of young people share the same beliefs whilst being proud to do so. 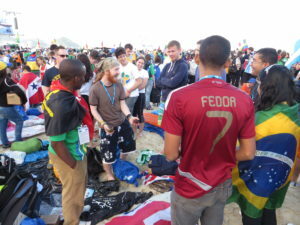 Since arriving at World Youth Day various events have inspired me to be enthusiastic about my religion and its ability to unite people of all colours and countries. One experience in particular was the visit to Sugar Loaf Mountain. Although typically a tourist attraction and not a religious landmark such as Christ the Redeemer, Sugar Loaf was the first time I truly experienced the warmth and enthusiasm of hundreds of young people for their faith, especially the Argentinean group giving out ‘free hugs.’ This inspired me to go on and really appreciate seeing the Pope at the Welcoming Ceremony on Thursday. Again the atmosphere was electric and although I struggled to get a photo of the Pope due to the sheer amount of people, the mental image of him driving by, kissing babies from the crowd will always stay with me. Over the next few hours we met some wonderful people, including monks, nuns and priests. We exchanged stories and presents with other pilgrims and the long wait soon turned out to be the perfect opportunity for cultural exchange. Everyone wanted to take pictures together, highlighting the scale of unity within our faith, that despite the language barrier or politics ultimately it’s God who unites us all in love.